Yes, this is as far as they got, as far as true normalization ever will go. Central banks are more done than you might imagine they would ever admit! Yet, admit they do … in a major way. Powell gave big hints in his latest speech of what the “new normal” will have to be. 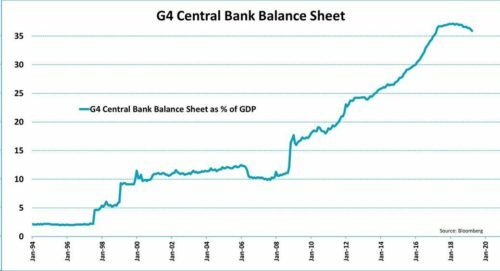 If you are content not to read all about the Fed’s big change, just this picture of how far central banksters got in returning their balance sheets (money supply) to normal levels before ALL of them ALL OVER THE WORLD ended normalization speaks volumes! A picture is worth a thousand words, but if you want the thousand words (and more) my recent Premium Post lays out in Fed Chair Jerome Powell’s own words exactly how DONE central bankers are with the idea that they can ever normalize the economy. The graph above proves central banksters were not able to do the thing I said they never could, even though they all said they would. Clearly, they did not get far before all of them found out to their chagrin and surprise they could go no further. The Fed hit the brakes on its tightening plans, and other central banks went further by returning immediately to more easing. Now the Federal Reserve is desperately scrambling to sell the public on its New Normalization — plans that even the Fed says change the world forever! It’s a change so big Powell lays out clearly the case for why the Fed must first engage the public in numerous town-hall meetings all over Amerika to sell the plan before it fully reveals the plan; but he says enough to suss out what the plan entails. With the exit plans having all collapsed, it is now on to a how-to-stay-in-the-game plan. My last Premium Post lays it all out. For everyone, however, I wanted to share this picture of the minuscule distance the central banks got down the path to normal before everything started going abnormal.